Crafted, developed by domp, is a sandbox game in a world made out of blocks. Before I even downloaded the app on my iPhone 3GS, I noticed the application looked extremely simliar to the computer videogame called Minecraft. Regardless of its similarity, Crafted soon became my favorite iPhone app on my phone. 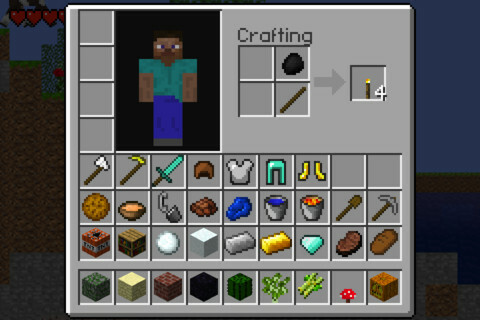 I started playing Crafted and noticed it’s almost the exact same thing as Minecraft, except it’s a 2D version rather than 3D. 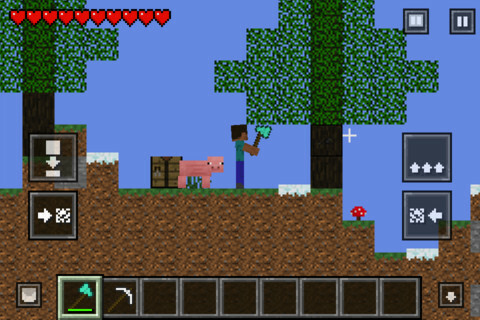 When you first play Crafted, you have to create a new world. This new world is randomly generated and can be saved and loaded whenever you want. My character spawned around a grassy area with a few trees and a pond nearby. Without having to take a single step, I already noticed some of the different blocks in the area: ores, dirt, sand, and trees. There is a large variety of blocks, but a chunk of them can only be found deep under the surface of the Crafted world. You can craft simple things into complex objects and build a house, weapon, armor, and several other things. The environment seems peaceful, but you better build some shelter before it gets dark – that’s when the monsters come out. After smashing some log blocks and crafting them into wood blocks, I made my own house, filled with a crafting table to create more items and a chest to store my items in. There are 35 different items that you can craft, but the amount of different structures you can build is unlimited. There isn’t much of a point to playing Crafted, but if you let the creative side of you run wild, it won’t take you long to become hooked. Players are released into a unique world generated just for them. They can craft, build structures, and fight enemies. Fairly simple and easy to get used to. To walk in a certain direction, slide your finger in that direction. You can jump or hit things with the buttons on screen. There is no music in the background, but there’s a realistic sound for every action you perform in the Crafted world. Very simple textures, feels like I’m playing something from the 1990s. That’s a good thing! For only a dollar, Crafted is a great deal. Time flies when you continue your journey of mining valuable ores in the deep mines and fighting off monters that lurk below the surface. Crafted offers hours of gaming entertainment to any type of gamer. With the ability to craft items, build structures, and fight off monters, the possibilities are endless. Crafted is available on the iPhone, iPod Touch , and iPad . AppSafari review of Crafted was written by Darius Reimm on November 4th, 2011 and categorized under Adventure, App Store, Fun, Games. Page viewed 8531 times, 1 so far today. Need help on using these apps? Please read the Help Page. ik vind crafted niet in de app store hoe vind ik hem? When I downloaded this game I did not like it much but slowly became addictive 😛 … Now I like to play it whenever I get time. I’m the kinda person who doesn’t have this game.